M11 is coming out Friday and as of the Prerelease, all of the new cards are legal for EDH. So what ones do you spend the time to go get and which ones really won’t make a difference in this great format? Are you Confused? How about Bewildered? Or are you here to laugh at my outlandish predictions when I nominate “so and so” as the best EDH card in the set? Are there enough questions in this paragraph for you or should I keep asking them? Why do you think I’m playing the question game? Since M11 is a Core Set and there are about 50% reprints, I’m going to mainly focus on the new cards. I will touch on some reprints as they are either good or bad for the format, I won’t spend too long on them in general. The cards that are in italics are reprints. If you notice, today’s it just White. Usually I’d write the whole thing up on one post, but when I reported to twitter (@mtgcolorpie) how much I’ve written just for White, they were like “Break it up, everyone else already does.” Yes, I’ve become a sheep to follow everyone else (Baaa). So, while it’s weird to get this started on a Tuesday instead of the more logical Monday, blame the twitter peeps. That means, yes, there will be a post for each color. 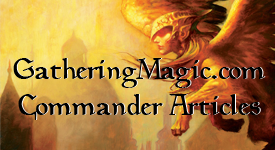 At the very end of it all, you’ll get my Top 10 list of EDH cards for M11. The interesting ability that’s beneficial for EDH is his Ultimate ability. It becomes a huge creature that you have to protect but can end games pretty quickly. Unless you’ve got tricks with giving your creatures +1/+1 counters, just go for the ultimate. I want to say that this ability happens when you gain life, so not every life you gain. With that in mind, this guy would go best in a deck where you gain life frequently, but not a large amount. Ajani’s Mantra would work well or any other of those type of effects. Too bad it doesn’t have evasion or it might be a powerhouse. Note: it is a soldier, for whatever that means. She’s not Legendary, just a big flying life-gaining fattie. There are bigger things that fly, and now every color has a two mana answer to her in M11. I have once put her in an EDH deck, but then took it out a few games later. Can always be scary to face, but not as dangerous as in constructed formats. Puts Generals on the bottom of their library. No one should care about the life gain. Is it good? Uh, yeah. Wrath of God 2.0. Was just printed in Zendikar and with this printing should drop down in price even further. This is one of those card you need to have in your EDH building repertoire as it’s always useful. As sorcery speed it’s not very great, but it does put a General on top of the library. This makes them have to re-draw it or even think about if they’re going to crack their fetch-land that turn. Not optimal, but can get the job done. Obvious card is obvious. Best for token creation decks. I can’t believe they were $12 a piece this time last year. This is great for that Knight deck you were building (with Rafiq of the Many as your General). Other then that, imagine it like other “Lords”; can only work so well if you can’t tutor for him and if there’s no good cards to help him out. Alas poor Exemplar, hopefully there’s a little more light around the corner. It’s a very good thing about EDH’s rules about color management otherwise this would be great in every deck ever (same with the Black Leyline). Now, it’s just a better Ivory Mask since you can target yourself. If you had Ivory Mask in your deck before, you can replace it with this and add some more spells that can now target you as well. The opening hand bonus is gravy, but not really needed all that often in early EDH games. There are other, better variants of this card out there. But it still is pretty solid for what it does at that cost, but of course the downside is that it doesn’t stop abilities from being played. This card continues to float around and I’m sure you’ll see it when you’re least expecting it. People are heralding this as the end all be all EDH card. Since you do start at 40 life, its ability kicks in and it suddenly becomes a 6/6 flying lifelink for 1 mana. I mean, that has to be good, right? Let’s break it down: On the first 3 or 4 turns, putting this guy down will be amazing. Because he already has lifelink he will help keep your life above 30 each time he attacks or blocks. But because he doesn’t have built in protection he can be killed pretty easily (ie almost every creature ever). But what happens if you draw and play him turn 10 when you’re below 30 life; how good is a 1/1 lifelink guy now? Yes, he’ll be great if you can stick him early, but if you can’t he’ll do no good for you. Since he’s a Human Monk, there’s no easy way to fetch him outside of Ranger of Eos. Is he an auto include in every White EDH deck? I would say maybe, on the off chance that the 7 in 99 odds you get him in your opening hand where it can be devastating. But he’s not the end all, be all guy. Ah, the first of the Titan cycle where all but 1 should see play in heavy EDH (You know which one I’m thinking of). 6/6 for 6 is a good ratio, especially when it has Vigilance. But the key to this cycle is the awesome enter the battlefield and attacking triggers they all have. It’s not when they are cast but when they enter the battlefield; flicker, reanimate and cascade to your heart’s desire. Sun Titan’s ability of returning ANY permanent with casting cost of 3 or less to the battlefield with its ETB/A trigger is a huge list of cards you can do, but let’s pick some fun ones: Oblivion Ring (Get rid of any non-land permanent), Bone Shredder (Terror on a creature), Animate Dead (Um, animate dead), Eternal Witness (Get stuff back), Pernicious Deed (Gotta kill ’em all), etc. You can do some crazy tricks with it and that’s why he’s so fun and good. Yes, this is a good card, and glad that it was the Pre-release promo, it will keep the price of it down. A 7/7 flyer for 7 will handle most creatures, but that’s not the true benefit of this guy. The redirect ability to hit another play is what makes this card genius. Yes, you can hit yourself for damage (like a Pain Land or anything that causes damage, not paying for loss of life) and redirect it to someone else. Basically a semi-Moat card, if you have the mana untapped since no one will want to attack you risking damage to them instead. Usually reanimation targets are more aggressive creatures, but this one might be the most fun to play around with in your deck. If you can get him early in the game, then it will be devastating but late game situations maybe where this guy will really shine. This Archon will be the silent MVP of your games until people wise up about him. One of my preview cards and I talked about the debate of if you want something that destroys something when it enters the battlefield or you can use it anytime after you cast it. It’s really up to personal preference. Of course, you could use both, no one’s going to stop you. In all, White mostly got help from the Rares and Mythic section. Cards like Solemn Offering (Do you really need to gain that 4 life?) and Blinding Mage can be used but I don’t think too often enough to get mentioned. What did you think of the list? Do you agree, not agree? Let’s hear your thoughts. This entry was posted on Tuesday, July 13th, 2010 at 1:14 pm	and posted in EDH, M11, Magic: the Gathering, Really Big EDH Review. You can follow any responses to this entry through the RSS 2.0 feed. I can see Sun Titan being far more ridiculous than Serra Ascendant.